We have been back in Africa just over a week. I’d tell you some highlights from our 40+ hour trip across the world, but I don’t remember much. However, in our first 12 hours on the continent we: had a flat tire, ‘discovered’ a couple new speed bumps (this little kingdom loves it’s speed bumps), had my credit and debit cards frozen because of ‘suspicious overseas use’, bought some HUGE mangoes and avocados on the roadside, got a welcome back ‘missed call’ from my favorite fabric saleswoman (you just let it ring once to let someone know you’re thinking of them), came home to a bird flying around inside of our house and within minutes of arriving home, Ellie was out running around with the neighborhood kids again. Some wonderful things, some not so much…all part of what makes life here a little bit…Unique? Afri-quaint? 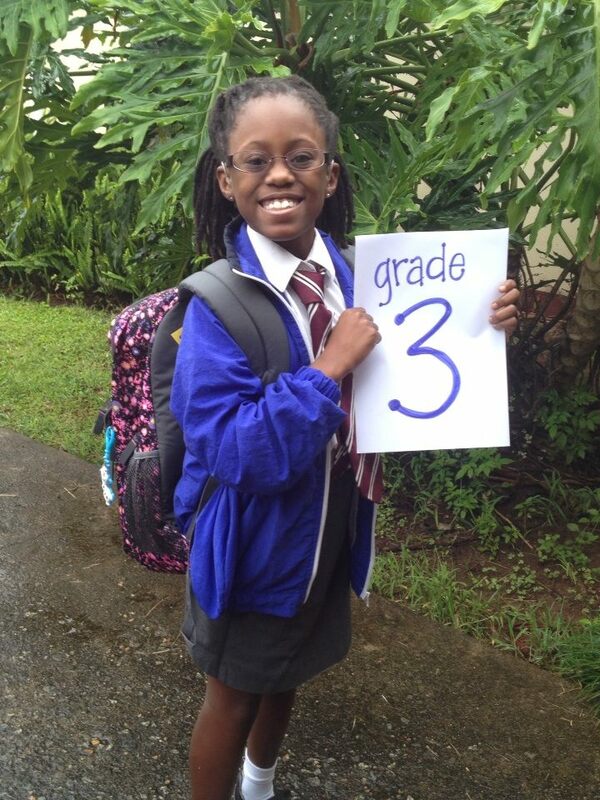 Anyway, we had Monday to recuperate a little bit, and then BAM, Tuesday came, and Ellie started 3rd grade. We were even on time since jet lag woke us up at 4am. I accidentally took a 4 hour nap while Ellie was at school that day. So far so good with school. Wednesday while Ellie was at school I headed into down town Manzini to buy all the school supplies we hadn’t managed to buy before school actually started. This time of year is CRAZY here (intensified by the jet lag). Nearly every inch of sidewalk is packed with people. It’s common for strangers to ask you for money to pay for their schooling. School fees are paid directly at the bank, and the lines are out the door and down the street. Yesterday I had to go to 4 ATM machines before I found one that actually had any money for me to withdraw. The headband girls taking a lunch break. Saturday Ellie turned NINE! 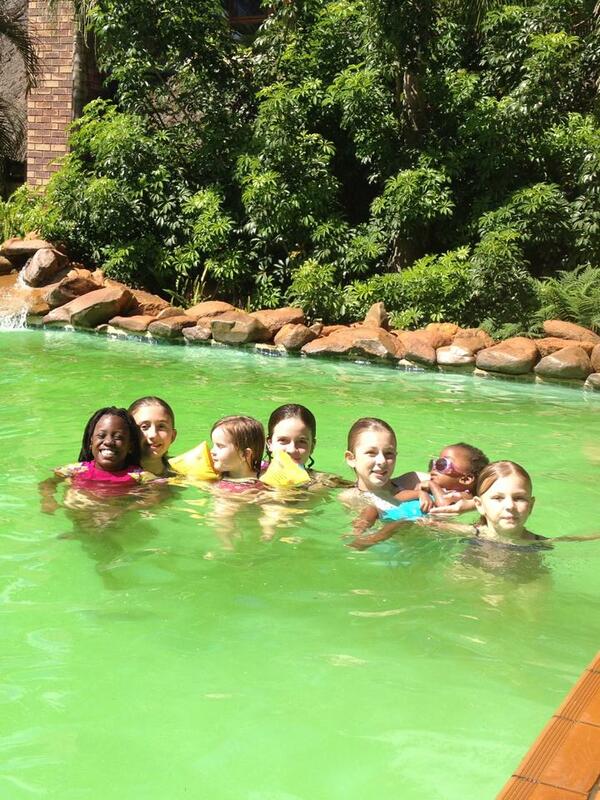 We had a little pool and pizza party at a local hotel (with a really green pool…eeek). Nine years has gone by much too fast, but they would have been long and boring without her I’m sure! Birthday girl with the other AIM missionary kids. While hanging out pool-side on Saturday, my co-worker, Amy, was telling us about her Friday adventure. There is a girl at one of the AIM/CHC care points that has had surgery/treatments for a large tumor that was growing on one side of her face. She is an orphan and lives with one of the Timbali women. Amy spent all-day Friday with her at one of the government hospitals, trying to get some things ironed out for her next procedure. I won’t recount all the details (surprise! ), but I will tell you that their visit involved going to and/or waiting at 14 different areas of the hospital before they finally got what they needed, and that getting to one of those areas required climbing up a rusted out staircase and swinging/jumping around part of it to avoid a missing landing (all while sporting a long missionary skirt I’m sure) . Amy was laughing and telling us the story while holding Mumu, a special needs child her family fosters. This lady does it all and has persevered through many hospital visits! 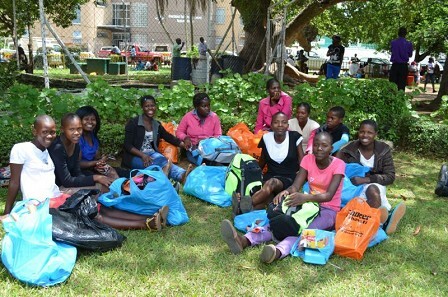 This past Monday we were able to distribute the Timbali women’s savings from 2013. It was WONDERFUL to see all the women after being away, and to see them so excited to receive their savings, which we are able to match each year as an incentive for them to plan ahead for big expenses such as school fees, home repairs, etc. My friend Thoko’s (one of the Timbali women) husband passed away while I was in the U.S. He had been sick for a while, so it wasn’t unexpected, but hard none the less. In the several years I’ve known Thoko she has also lost 2 of her children, and she also has health issues herself. Please pray that Thoko would know the Lord’s strength and comfort and that her faith would remain strong. 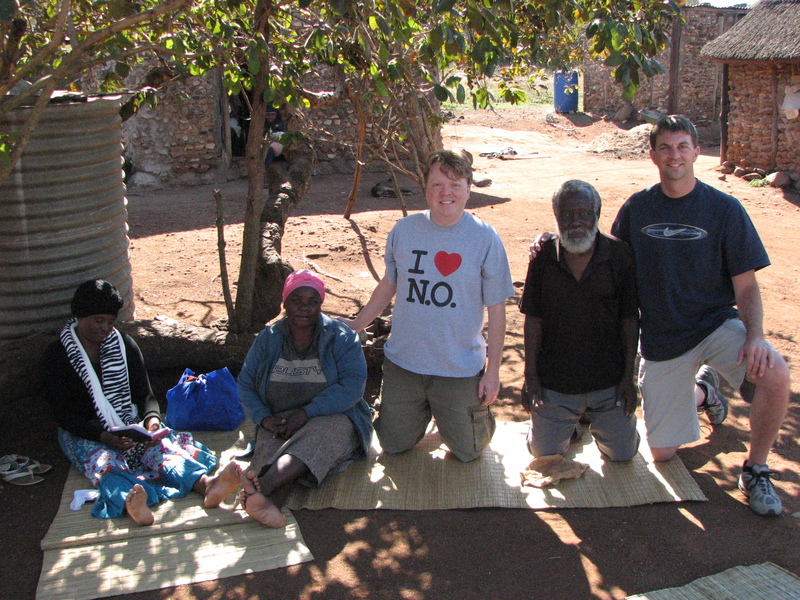 This is a picture of Thoko and her husband with my brothers when they visited in 2011. I PROMISE I won’t post a play-by-play of every week in Africa, (if you have followed my blog in the past you know it may be months before you hear from me again!) but thought I’d share just a few glimpses of our first week back. I’m thankful for many things, but I’m especially thankful to have a front row seat to watch God provide for so many needs! He is faithful. Great blog! We always love reading about what’s happening in Swaziland; especially when you and Ellie are involved; also love the picture of your brothers when they were there. I just came across your blog and really enjoyed it! I am a missionary in Colombia (since 2010) and have started a ministry similar to your’s (though you are WAY ahead of me!!). Would love to connect and pick your brain a bit. Loved reading your bio, we have A LOT in common! !